Verandas come in two distinctly different styles. There is the traditional appearance that suits period properties or the contemporary style for the more modern properties. SBI offers one of the widest ranges from the UK and continent. Should you prefer a traditional looking veranda we have lattice and lamp post style posts. Should you prefer a contemporary style then look no further than our Veranda Lux model with its square posts. 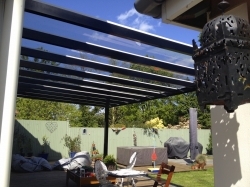 The traditional verandas are constructed from aluminum components, which are maintenance free, no rusting. 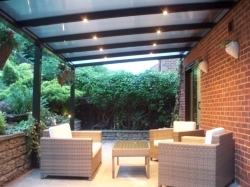 The framework is powder-coated in many RAL colours to achieve a superior and hardwearing finish. 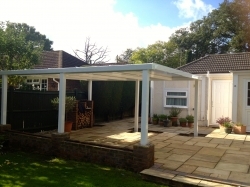 A new veranda will provide a protected area from the weather, with the advantage of plenty of fresh air. Verandas are the ideal place to sit and relax with family and friends. Whatever the weather you will have added a versatile space to your home that will add style and value. 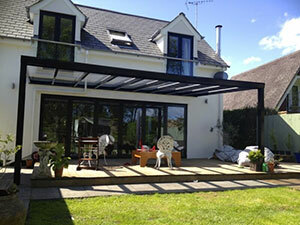 Verandas are made to measure and installed with utmost care by our dedicated installation teams. Please call on 0800 074 2721 for our free no obligation advice and free home design service. SBI’s Veranda Lux Patio Roof: Style Pent Roof with integrated spot lights, powder coated in a chocolate brown finish. 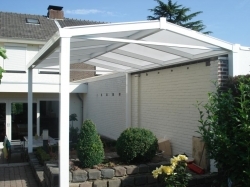 SBI’s Veranda Lux Patio Roof: Style Free Standing Canopy with an integrated rain water system, powder coated in a pure white finish. SBI’s Veranda Lux Patio Roof: Style Apex Roof that can be either wall mounted or free standing, powder coated in a pure white finish. 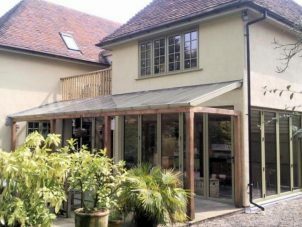 SBI’s Veranda Lux Patio Roof has so many options, from different glazing types, frame work colours, built in lighting, build style from lean to, apex and free standing.